Kebon Melati PPSU personnel, Tanah Abang, Central Jakarta prepares hundreds of trash bag on the side of Krukut River.
" We put those trash bags behind residents' houses"
Those trash bags are prepared to encourage local residents for not throwing garbage to the river. "We put those trash bags behind residents' houses. 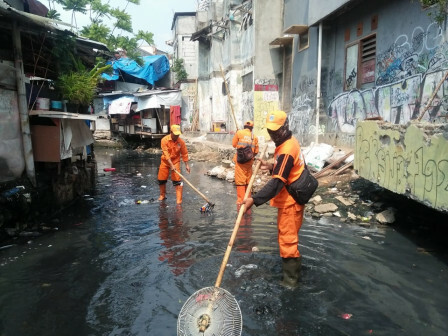 While we also distribute the remaining bags to residents to prevent them from throwing trash to river," stated Dedy Budianto, Kebon Melati Urban Village Head, Tuesday (9/11). According to him, 12 PPSU personnel are also deployed to clean up Krukut River across RW 12, 13, 14, 15, and 16 from trash. Personnel will transport the collected trash to Karet Bivak TPS. His side also asks related department to dredge Krukut River since it is silting. "We also ask them to build retaining wall on the location," he conveyed.